Pepper is mistakenly assumed to be used just for seasoning. However, it has an extensive list of benefits to offer, both on and off the table. Black pepper was once one of the most traded spices worldwide, often referred to as “black gold” because it was used as currency throughout the commercial routes between Europe and India. Since then, a myriad of health benefits and medicinal uses have been uncovered for the pepper plant, from which black, white, and green peppercorns come from. Improving digestion. Pepper increases the absorption of several vitamins and minerals and stimulates saliva secretion to ultimately assist with the breakdown of food within the digestive system. Preventing chronic diseases. 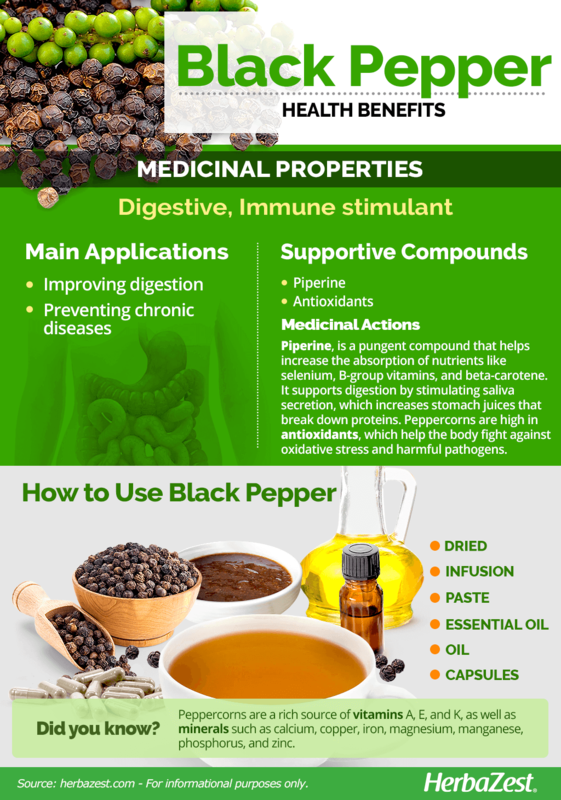 Black pepper is able to increase the bioavailability of other foods and drugs, thus potentiating their effects within the body and stimulating the immune system. Pepper is high in antioxidants, which help the body fight against oxidative stress and harmful pathogens. Piperine, a pungent alkaloid found in pepper, helps increase the absorption of selenium, B-group vitamins, and beta-carotene, among other nutrients. It also helps stimulate saliva secretion, which increases the production of digestive juices, responsible for breaking down proteins, increasing digestibility and reducing the possibility of heartburn and other gastrointestinal issues. Piperine also increases the bioavailability of certain compounds. This is especially true when it comes to curcumin, the active compound of turmeric that helps fight inflammation. In a study published in Planta Medica (1998), it was found that piperine enhanced the extent of absorption (bioavailability) and serum concentration of curcumin in both rats and humans with no unfavorable side effects. Piperine also interferes with inflammatory signaling mechanisms and inhibits pro-inflammatory cytokines, which are small proteins secreted by some cells and linked with a number of degenerative diseases. Moreover, black pepper's antioxidant content helps the body to fight and repair the free radicals' damage that contribute to cardiovascular diseases, inflammation, and more. PEPPER CAN HELP THE BODY FIGHT AGAINST OXIDATIVE STRESS. Immune stimulant properties are also present in echinacea, whereas oregano and cloves provide similar digestive effects. Pepper may cause sneezing if inhaled and a burning aftertaste if consumed in excess. Like most other fruits and vegetables, it should not be consumed in high concentrations. It is mostly likely safe to use moderate amounts of black or white pepper in food. If signs of an allergic reaction appear, consult with a trusted medical professional. There is a risk of skin sensitivity for those who apply black pepper essential oil topically. Keep it out of reach of children, and avoid contact with the eyes, ears, and any other sensitive area. Those who are pregnant, breastfeeding, taking medications, or under a doctor's care should consult a physician before using black pepper essential oil. Also, those who have ulcers or have undergone abdominal surgery should avoid pepper consumption, since it may irritate the intestines. Black pepper is the most commonly used spice around the world. It is enjoyed in a wide variety of culinary dishes; however, peppercorns also have medicinal applications and can be made into remedies. Dried. Hot, pungent, and spicy peppercorns are from black pepper, However, any form of pepper can be used in meat dishes, sauces, and other types of food. Infusion. The infusion of pepper is thought to help relieve the symptoms of arthritis, fever, headaches, strep throat, and poor digestion. Paste. Black pepper paste can be applied to treat hair loss and some skin diseases, while white pepper paste is thought to be useful for treating eye diseases. Essential oil. Essential oil preparations are also believed to help fight viral infections, colds, chills, muscle aches, joint pains, throat ailments, and more due to their high levels of antioxidants, vitamins, and minerals. It is best to apply the oil mixed with a carrier oil topically or use it aromatically. Oil. Alkaloids in the oil made from cold-pressed peppercorns are believed to help with pain relief, flu, colds, muscular aches, and fevers, as well as enhancing circulation. Capsules. Black pepper can be found in supplemental forms, mixed with other herbs, such as turmeric, in order to aid their absorption. Ground or whole peppercorns are available for purchase throughout the year in grocery stores, supermarkets, specialty stores, and online. It is recommended to buy the whole peppercorn and crush it when ready to consume, either with a grinder or manually. Once the hard shell of the corn is cracked open, the scent and flavor will quickly disappear. PEPPERCORN AND CRUSH IT WHEN READY TO USE. 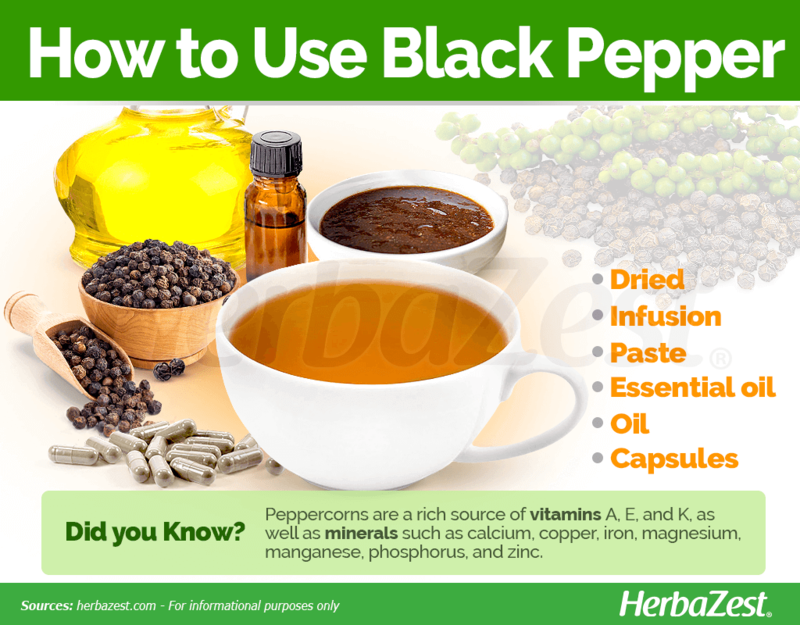 In supplemental forms, often mixed with other herbs, as well as in essential oil, black pepper is readily available for purchase in specialized health stores and through online retailers. Pepper is a flowering, woody, perennial climbing vine that typically grows in the tropical forests of India, but it is also a valuable crop in different parts of the world. Wherever it is cultivated, the so-called “king of spices” needs some specific requirements to thrive. Pepper plants are propagated through seeds and cuttings. Pepper plants require high humidity and generous watering. They do not tolerate excessive heat and dryness. The crop tolerates temperatures that are between 50 - 104°F (10 - 40°C). This vine grows best in well-drained, loamy soils that are high in organic matter and rich in humus. The plant requires partial shade in order to not turn yellow. The top portion of the vine receives more sunlight than the rest, but the rest of the plant is mutually shaded on down. This vine requires living or nonliving standards for support and successful growth. One of the most prominent pepper viruses is the cucumber mosaic virus. Other diseases include tobacco etch, tomato spotted wilt, potato virus, pepper mottle, and alfalfa mosaic virus. More detailed information about growing black pepper can be found in our herb garden section. Pepper plants have dark green, almond-shaped leaves that are two to four inches (5 - 10 cm) in length and about one to two and a half inches (3 - 6 cm) in width, alternately arranged. The inconspicuous, petal-less pepper flowers grow in clusters along the flowering stalks or spikes, which are nearly as long as the leaves. The length of the spikes goes from about three to six inches (7 - 15 cm). Each fruit or drupe on the spike contains a single seed. Drupes starts green and then ripen into a dark red color. There are up to 60 drupes on each spike. The collected spikes are sun-dried to separate the peppercorns. There are three different types of peppers that can be created from a single drupe depending on when the fruit is harvested and how it's processed. The freshly harvested, unripe green fruits may freeze-dry to make green pepper. Drupes that are picked when fully grown but still green are sun-dried and used as black pepper. When the drupes are slightly riper, they're used to produce white pepper. These are soaked to remove the fleshy red skin so that the stony seeds can be sun-dried to make white pepper. The botanical name of black pepper is Piper nigrum, and it belongs to the pepper family (Piperaceae), which consists of four genera and about 2000 species, all of them native to the tropics. It is important to mention that in the past all Capsicum anuum cultivars, such as cayenne, chili peppers, and bell pepper, were included in this family but later separated, since they are not true peppers at all but members of the nightshade family (Solanaceae). The Piper genus comprises over 1000 species, some of them of medicinal and economical importance, such as long pepper (P. longum) and kava kava (P. methysticum). Out of the over 100 cultivars of black pepper, few are high- and stable-yielding. Moreover, each pepper-producing country has identified and cultivated varieties most suitable for its growing region. For example, over 75 cultivars are grown in India, and many are tolerant to a prevalent root rot known as Phytophthora. Some popular Indian cultivars include 'Karimunda', 'Neelamundi', and 'Kottanadan', among others. Black pepper is one of the earliest spices used by mankind, and it is native to southern India, where it grows wildly. It started moving westward about 4,000 years ago. It was one of the most widely-traded spices in the world and is often referred to as “black gold” and the “king of spices,” seeing as it was used as commodity money throughout the trading world between Europe and India. During the middle ages, the price of pepper was exorbitantly high. Therefore, pepper in Europe was one of the most esteemed and important spices, often used as a medium of exchange when money was short. Nowadays, it is cultivated all over tropical areas as a commercial crop. On average, about 260,000 tons of pepper are traded yearly on the global market. Vietnam is the number-one exporter of the spice, with over 96,000 tons in 2004, valued at $136.6 million USD in the United States. The major worldwide producers are India, Indonesia, Brazil, and Vietnam. 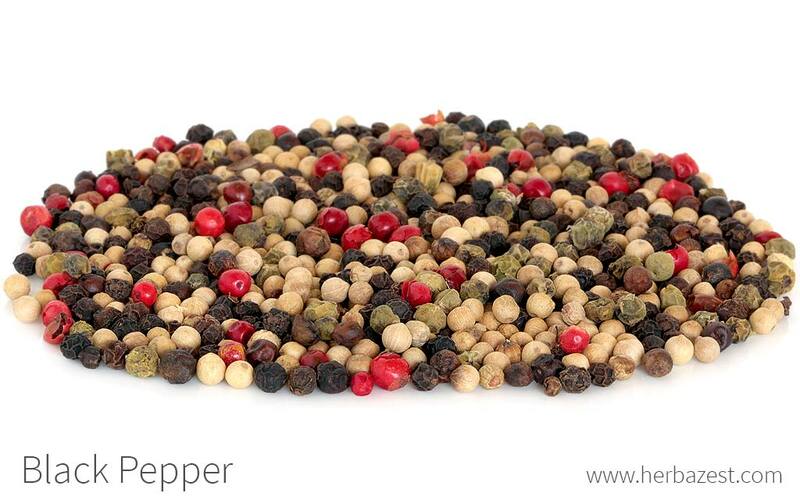 Peppercorns that originate from Kerala, India are particularly noted for their flavor and pungency. India produces about 10% of the peppercorn in the world market. Insecticide. Pepper has also been used for non-medical applications, such as a natural insecticide. Pepper has a variety of medicinal uses aside from its culinary uses already complemented by its most popular partner, salt. 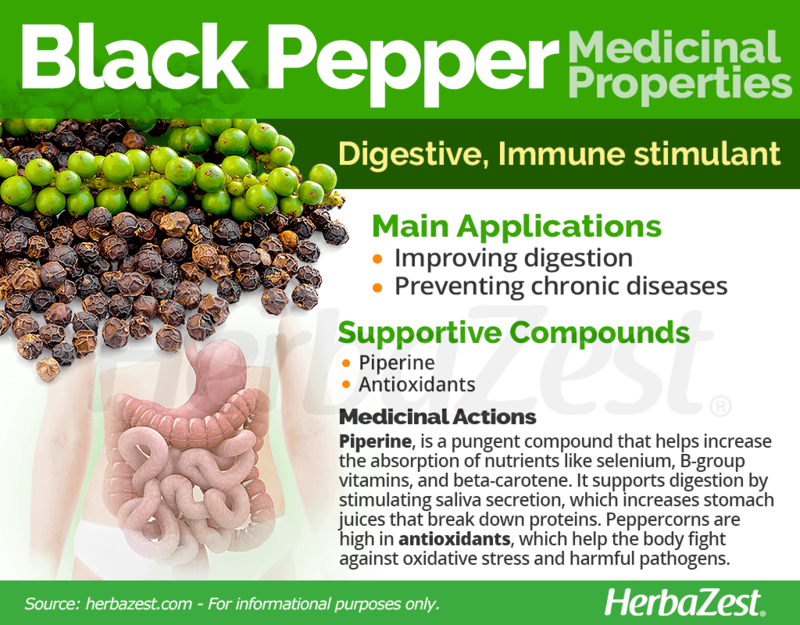 Pepper's antioxidants and alkaloids help with improving digestion and preventing the occurrence of chronic diseases. From its long history to today, pepper serves as a promising spice in any cuisine. University of Connecticut, Piper nigrum L.